What fidget spinner is that? As you can see, this trick is a motion picture trick of a Fidget Spinner. Although it may be challenging at first, it can bring hours and hours of mindless entertainment, unlike a real fidget spinner. 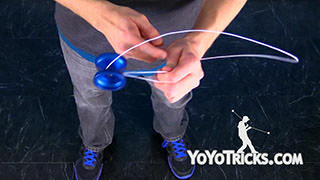 This is a slack trick so before you get started, just make sure that your string tension is neutral. This will allow the loops to stay open as you do the trick and not get tangled. You are going to start off with a Trapeze. Before you do anything, just make sure that your proportions are correct. 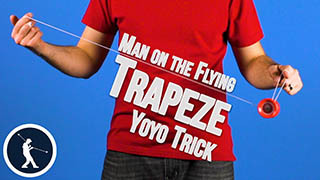 The loop of the trapeze should be about one third of the length of the string connected to your throwhand. 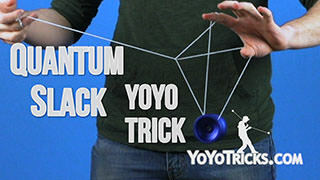 From here you are going to pinch with your index finger and your thumb, and the first element of this trick is similar to the first element of Yuuki Slack, so if you have not already, go check out that video. 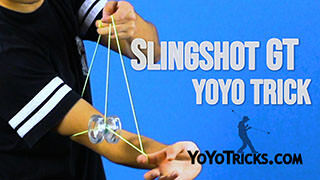 You are going to swing the yoyo around and create a slack, but instead of bringing the slack over your wrist, when you swing the yoyo around, you are going to let the yoyo go in front of your hand and go onto the string connected to your throwhand. As you are completing this element, you want to make sure that your hands come closer together. That will give the slack room to form. 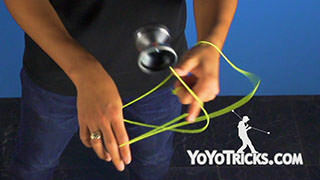 If you pull your hands too far apart, the slack will just fall into the gap of the yoyo. 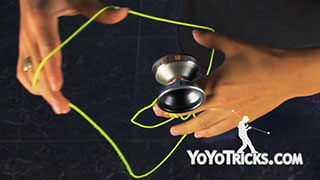 When you do this part, you do not need to land on that string, but it helps a lot when you are first learning to stop the yoyo there. 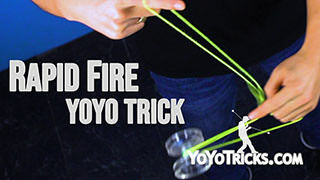 When I do the trick normally, I will just swing the yoyo to the front fo the string, instead of landing it. 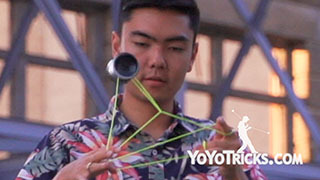 Also, make sure you maintain the pinch on your non throwhand and that the slack falls in front of the string connected to your throwhand instead of in back of it. 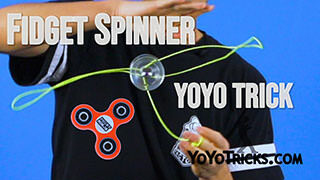 Now you are going to bring your throwhand under the yoyo to the opposite side and this is where you are going to start the Fidget Spinner part of the trick. 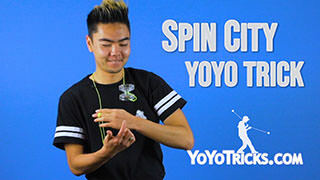 You are going to swing the yoyo and as it is coming over to your opposite side, you are going to throw the string that you are holding onto to the outside of the yoyo and also catch the bottom string as it is coming up. 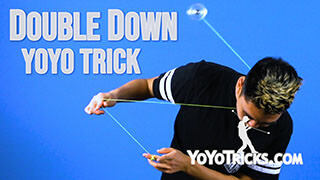 Simultaneously, you are going to move your throwhand over the yoyo to the throw side of the yoyo. Although it may be tempting at first, do not try to catch the loop on your finger because that will just cause the slack to drop. What you want to do instead is actually grab the strings. I find that the best way to do it is pinching with your index and thumb, and holding loosely with your remaining fingers. This will allow you to catch and release easier. 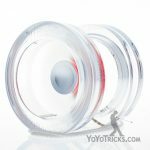 Also make sure that you do not slide the yoyo along the string because this will mess up the slack and the yoyo might snag. 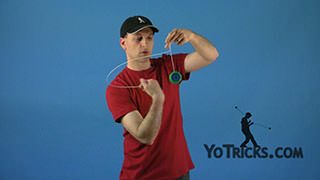 From this position, you are going to then again toss the slack that you are holding onto over the yoyo to the outside. 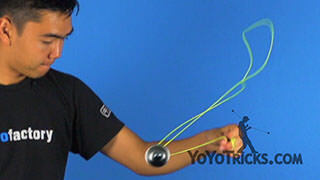 Catch the bottom string as it is coming up, this time bringing your throwhand under the yoyo to the opposite side. 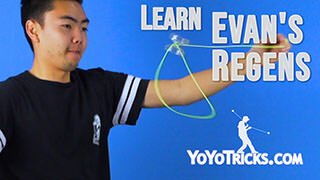 I know what you are thinking, this trick seems insanely crazy, uh, but, I am going to give you a few tips to help you with this trick. The first tip is to make sure that the slacks are both about the same length as you are swinging it around. Also, you want to keep your hand in relatively the same position and allow the slacks to go around when you catch them. Finally, you want to make sure that you are continuously moving your throwhand around as the slacks are going around. Also, once you get the rhythm down, if you go a little faster, you may find that the slacks are more consistent to catch. 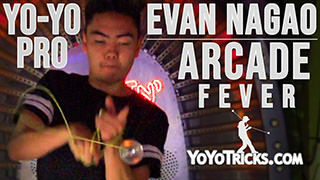 When you want to finish the trick, just make sure that your hands are back in this position, where your throwhand is to the throw side of the yoyo, and you are going to throw the slack that is in your non throwhand to your throwhand, and catch it. Also, catch the slack that is hanging down back in your non throwhand, like so. Once you are here, you are going to release the string that you are holding with your throwhand and roll over your non throwhand. 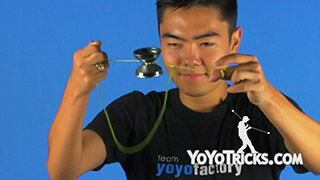 Then you are going to dismount the yoyo and bind. 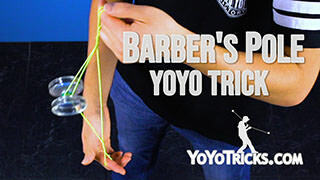 Once you get good at this trick, the challenge is to see how long you can keep it going for. And that was Fidget Spinner. Dude it is impossible, bro. 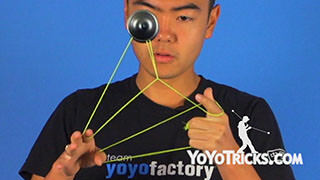 I feel bad for Stevie Wonder, he can not yoyo. That is too bad.